Every year about this time I think to myself, " this year I won't write it, it's always the same. This year I won't need to" But here we go again. Six weeks of schools closed, kids at home, screaming at Fifa and hours of that pointless program about that bloke who is way to young to be a teacher. It's not that I fall into the trap of Hallmarking the summer break, far from it, I know that it will be arduous and akin to the lowest region of Dante's Inferno. I try, I really do, I try to engage my little (well not so little anymore) offspring and this year I thought it would be different. This year we are 20 minutes walk (yeah right!) from the beach. So, I reasoned to myself that if they get a little too much then off to the beach we go and I can encourage them to try and swim to France (aren't there blue sharks off Bournemouth pier this year and aren't they children eaters? just a thought) As the final school day (half day actually) drew to a close I remarked to a mum , as I walked to pick up smallest not little offspring, "here we go again" she smiled the smile of common pain shared and remarked that she "found children really irritating most of the time anyway". Six weeks of the little dears being at home is going to be troublesome and I don't even have alcohol to fall back on this year. It's not all bad as we are going to the cinema and MacDonalds to celebrate his 13th birthday but I am scared that the quality Dad time I love is going to be put on hiatus soon. He has been through so much and we have grown close but I risk losing that relationship if I get this wrong. It is a burden that hangs heavy around my neck and I worry that I am scarring him emotionally. All these worries are probably ones that are shared by most parents but does that make them any less worrying? My children are mini Jekyll and Hydes and like the potion guzzling Doctor, they transform just as suddenly. It is the change from cuddle giving children to monsters that wrong foots me every time as does the total lack of perspective and dizzying "me centredness"One minute I am public enemy number one and the next I need to avert another world ending crisis! I have always viewed parenting in the way of guiding my children through their formative years and whilst you don't calmly explain why getting out of the road is a good idea when a Juggernaut is screaming down on them (shout, SHOUT AGAIN) I do feel that children need to understand why rather than do just because. Equally they need to feel what it's like to lose their tempers and thus hopefully learn coping techniques to quell the red mist. 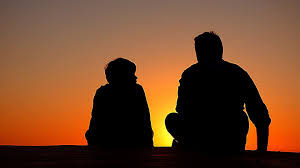 I think it also helps that my teen in waiting is very much like me and I understand him probably better than he knows. I see the nervous smile and I can hear the desperate pleas not to belittle and ridicule, Equally, I see the anger that often is misunderstood for petulance and disrespect as the embarrassment and confusion that really fuels it. I want to walk alongside him and to tell him that it will all make sense in the end. There is nothing he can do that will make me love him any less and I will always have his back but sometimes its hard when he shrugs my arm away and pushes. No one told me parenting was so hard and no one prepares you for the emotional journey but I am blessed in having a wife and support network who walk this walk with me. When I falter they help me up and we go again! So summer time yes, here we ago again, but not I think on my own!